Dare I say this novel was predictable? Before I get lambasted, let me add to that by stating I’ve probably never enjoyed a book I found so predictable as much as I enjoyed The Book Thief. It’s a solid read, well deserving of all the hype it’s garnered. Still, I found myself only slightly disappointed by a few minor points. For one, the narrator is none other than Death himself, which I found extremely annoying and gimmicky at the beginning. However the voice grew on me, and the further I read the more I realized it’s a better story with Death at the helm instead of a generic third-person narrative. I could have done without his smattering of short, bold notes every so often. You’ll know which parts I mean if you’ve read the book. Well, you know there’s going to be a kiss between Liesel + Rudy at some point and by the time it happens you’re not really surprised at all. This is World War II, so you also know that the bad stuff is coming at some point. And boy does it ever. The Jew in the basement is a predictable scenario as well, though the relationship between Liesel + Max was still endearing. Okay, I get that Liesel’s stealing of books was a parallel to Death’s taking of souls, but I never found the book aspect of the story all that engaging. I don’t know, maybe I’m an emotionless robot or maybe I just expect too much from a much-lauded novel. Overall though, this is a strong book, perhaps a bit long-winded, and it crosses reader demographics – being perfect for lovers of literature of any age. 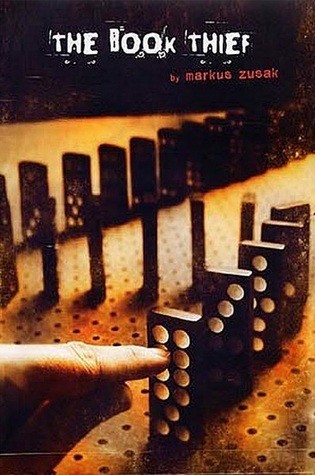 This entry was posted in Book Reviews and tagged Book Reviews, Fiction, Markus Zusak. Bookmark the permalink.